Unlike most of his contemporaries, such as Claude Debussy and Maurice Ravel, who were introducing jazz elements into their music unsystematically and randomly1, George Gershwin was the first (and, strictly speaking, the only one) to take on the challenge to ‘symphonize’ jazz, thus proving that a purely jazz idea might be transmitted by purely classical means, without garbling2 the essence of what is accepted as the spicy jazz harmony. His parents were driven out of Odessa because of the infamous Jewish pogroms. They were forced to come to America on board a dilapidated11 ship and settled down in Brooklyn, one of the most notorious areas of the time. Maurice and Rosa Gershovich had already been used to abominable living conditions, and it was in this environment that George was born on September 26th, 1898. On the sly12, Maurice had substituted his last name to Gershwin by that time. Extreme poverty and bureaucratic problems kept the Gershwins from giving their children a good education. Ira, George’s brother, friend and co-author, was bought a piano to take lessons, but it was George who was more passionate about music. However, the most systematic education George obtained was moving chairs in cheap New York theatres. His passion for music went in parallel with his admiration for folk tunes he heard so often in Afro-American quarters. Somewhere in the back of his mind he felt that a completely new musical idiom13 would emanate14 from the Blacks’ baffling15 rhythms. These recollections of his childhood remained within him, and they were connected with fishing villages. At that time the term ‘jaz’ or ‘jazz’ had mostly pejorative16 connotations, but Gershwin’s desire was to wrangle17 out the right for this music to exist and to be admired. Having taken some more or less systematic lessons from Hambitzer (piano) and Goldmark (harmony), he came to an idea to blend European symphonic tradition with jazz. Gershwin who began as a song writer rather than a man of the theatre, by 1924 had two hits with lyrics by his brother Ira (from the show Lady Be Good): Fascinating Rhythm and The Man I Love. His Rhapsody in Blue (1924) in the same way bridged the gulf between popular music and the concert hall by combining the languages of jazz and Lisztian18 romanticism. The listener of today can not, of course, fully appreciate how fresh Gershwin’s music sounded in that period, for our subsequent experience of music has already obliterated19 all aesthetic contradictions of the early 20th century. He attacked the musical world with his peerless Piano Concerto in 1925. 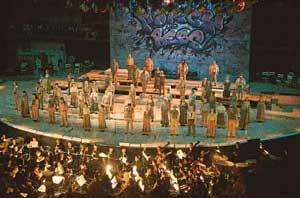 It produced a storm of praise, the critique declared the work to be one of the masterpieces of the contemporary music. The Concerto is really one of the most performed compositions of the twentieth century. Its wispy20 and wayward21 melodiousness enchants performers and listeners even nowadays. Jocose22 and hilarious23 in one way, tragic and matted24 in another, Gershwin’s music nevertheless bears in itself one characteristic trait: it is whimsical25 and unfeigned, straightforward, without mannerism, fearless in exploiting new, previously unheard-of elements. After the success of the Piano Concerto he found himself in a serious predicament26. Now, after being recognised as a first-rate composer, he could no longer continue with operettas and musicals. The time has come: he has since long been craving27 for composing an opera. A recently published novel Porgy by DuBose Heyward (1925) answered to all Gershwin’s needs and childhood remembrances. The plot, dramatic and humoristic, was deftly28 structured. 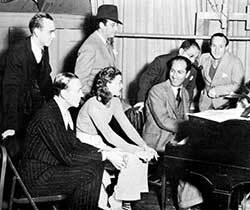 In a few weeks Ira compiled the libretto; Gershwin composed the tunes and wrote them down. Still, before putting the opera to stage, they had to obtain permission from Heyward. It was not an easy matter to persuade the writer, for the latter did not want to hear anything about meeting a ‘Broadway composer’ who was most likely to cheapen29 the plot of his work. With great difficulty Ira and George managed to get DuBose and Dorothy Heyward to attend a home rehearsal. But when the two brothers were through singing Summertime, Heyward was convinced. Porgy and Bess which Gershwin called a folk opera, was simultaneously produced as a musical and an opera, erasing the boundary between so called popular, or vernacular30, music and classical, or cultivated, traditions. By the beginning of the twentieth century classical concert halls became deserted, mostly due to the fact that the musical idiom started becoming more and more complex concert after concert. A common listener could not follow all the newest trends appearing in music, therefore, he could not appreciate the beauty, for example, of Alban Berg’s findings. Driven out of concert halls, the listener streamed to Broadway theatres, where he could satiate31 himself with music he could understand. With wit and mastery Gershwin built a bridge between what is known to be light music and classical tradition. Nowadays considered one of the peaks of the twentieth-century music, it still sounds fascinating despite the fact that almost a century separates us from the first performances.